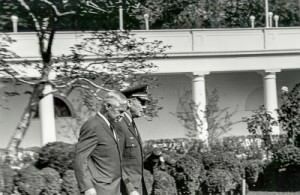 Paul Nitze and General Maxwell Taylor leave a meeting of the ExComm on October 29, 1962. I often refer to this as the Strangelove clip because it sounds like it could have been lifted from the pages of Stanley Kubrick’s script for Dr. Strangelove. It’s comforting to think that the people making the decisions about war and peace have all the latest information and a perfect understanding of the situation. But it only works that way in the movies and on TV. In this real-life example, secretaries of state don’t necessarily know what missiles are on alert where, defense leaders are more worried about sparking bureaucratic resentment than clarifying standing orders, and even presidents are confused about the acronyms that denote plans for global thermonuclear war. Just hours before his October 22, 1962, speech to the nation, Kennedy convenes a meeting of his Berlin advisers. He wants to make sure that American commanders in Europe won’t fire off their missiles without a direct order from the president himself. Absurdly, he runs into resistance from Assistant Secretary of Defense for International Security Affairs Paul Nitze to issue a clarification. And in the course of the discussion, the limits of their control and communication become all-too apparent. McGeorge Bundy And have that question mark. They haven’t got the answers. JFK Not to fire their weapons after that. George Ball You raised that with Defense, didn’t you? Paul Nitze [Robert] McNamara and I wrote out a suggested instruction from him [President Kennedy] to the Chiefs and we took it up with the Chiefs. The Chiefs came back with a paper saying that those instructions are already out. JFK Well, why don’t we reinforce them because, as I say, we may be attacking the Cubans, and they may . . . a reprisal may come on these. We don’t want them firing [nuclear warheads] without our knowing about it. Dean Rusk The ones in Turkey are not operational, are they? Paul Nitze Yes, they are. Dean Rusk Oh, they are. Roswell Gilpatric Fifteen of them are on alert right now. JFK Can we take care of that then, Paul? We need a new instruction out. Paul Nitze All right. I’ll go back and tell them. JFK They object to sending a new one out? Paul Nitze They object to sending it out because it, to their view, compromises their standing instructions. You know you reinforce one standing instruction . . .
McGeorge Bundy Let’s have a look at the existing order and see how definite it is, and then simply say: "The President directs your attention again to umpty-ump section . . . "
McGeorge Bundy Surely it can be done one way or the other. Paul Nitze They did come back with another point, and that is: NATO strategic contact [Soviet nuclear attack] requires the immediate execution of EDP in such events. Paul Nitze The European Defense Plan, which is nuclear war. Paul Nitze No. They said the orders are that nothing can go without the presidential order. JFK But you see, but they don’t know in Greece and Turkey—ah, Turkey and Italy—what we know. And therefore they don’t realize there is a chance there will be a spot reprisal. And what we’ve got to do is make sure these fellows do know, so that they don’t fire them off and think the United States is under attack. I don’t think we ought to accept the Chiefs’ word on that one, Paul. JFK I understand why they did that. These fellows think everybody knows as much as we know. And they don’t. Dean Rusk They might decide the nuclear war is already on. Paul Nitze Well, I’m sure that these fellows are thoroughly indoctrinated not to fire. I mean this is what McNamara and I went over to look into, and they really are indoctrinated on this point. JFK Well, let’s do it again, Paul. Excerpted from Ernest May and Philip Zelikow, eds., The Presidential Recordings: John F. Kennedy, vol. 3 (New York: W.W. Norton, 2001) pp.33-35.